Active in the progressive milieux of the early twentieth century American art world, Friedman pursued his own aesthetic vision, skillfully drawing from the avant-garde idioms of his time while a full-time employee of the Postal Service. Early works in the exhibition include vibrantly faceted Synchromist pieces from this period when artists explored color as analogous to music. In the early 1920s, Friedman explored the smooth contours of classical monumentality that artists and critics championed after the destabilizing First World War. In Leaf Abstraction (1923), Friedman employed the tenets of Purism and careful geometries to create smooth, solid forms that also define his Madonna and Child (circa 1924). Man Rowing (Sculler) (circa 1930-33) uses these classicized forms to acknowledge the history of art. In the 1930s, Friedman developed views of the New York City area that would become a hallmark of his later career. In landscapes such as The Basin (1938), Highway Scene (circa 19435-40), North Drive (Grand Central Highway) (circa 1935-40), and High Tide (circa 1935-40) dramatic, patterned compositions define carefully ordered vistas. Far from the quotidian, these scenes share a visionary quality. 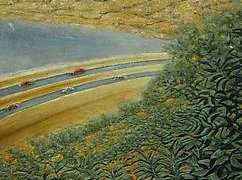 In Ulster County Landscape (1940-46), Untitled (Tugboat Scene) (circa 1935), and View of Palisades from Manhattan (1946), Friedman took abstraction further, depicting nature in symmetrical areas of heavy, stippled impasto. His Tree Stumps (1945 or 1946) employs a bold palette to portray a strikingly spare tableau of denuded nature. Similarly, Friedman’s interiors and still lifes are elevated from the everyday through strong, non-naturalistic color, as in Still Life (circa 1942-46) and Interior with Cat (circa 1942-43). Friedman also distinguished himself as a painter of urban scenes, particularly of bustling streets, such as Park Avenue (circa 1940) and Untitled (Two Views of Park Avenue) (circa 1939). Later work of the 1940s moved in a remarkably avant-garde direction. Landscape (circa 1945-46) is an abstracted composition of built-up colors patterned into a mass of pigment, both dense and airy, that clearly draws associations with non-representational work of the younger generation of modernists, and thus prophesies future directions of post-war art. Such constant change and continual experimentation defined Friedman’s long and accomplished career.